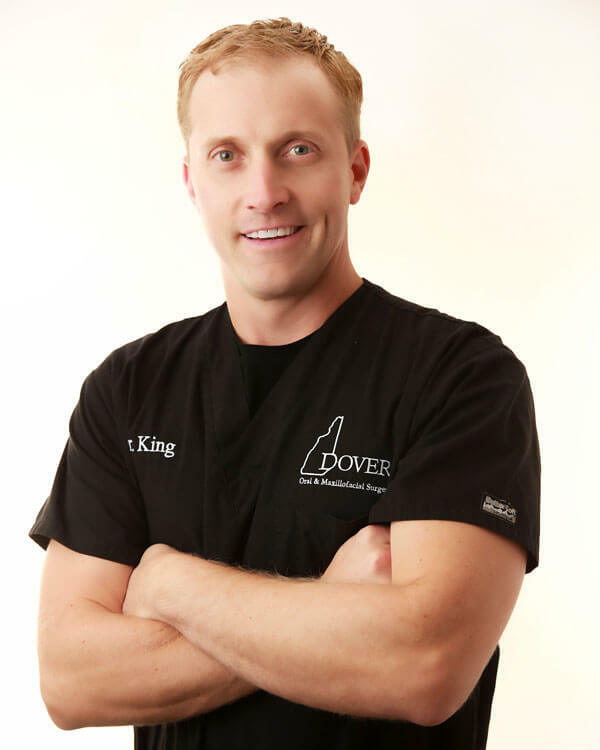 Dr. King is a Board Certified Oral and Maxillofacial Surgeon practicing in Dover, New Hampshire. He graduated from Phillips Academy in Andover, Massachusetts and from Bowdoin College in Brunswick, Maine. He received his Doctorate in Dental Medicine from the University of Connecticut School of Dental Medicine and then completed his Oral and Maxillofacial Surgery residency training at the Hospital of Saint Raphael and Yale-New Haven Hospital in New Haven, Connecticut. Dr. King is currently on staff at Wentworth-Douglass Hospital in Dover, New Hampshire. Dr. King offers a wide range of oral surgery services with a particular focus in dental implant placement and complex tooth removal including wisdom teeth. Passionate about his work, Dr. King loves to share his abilities to create new smiles and has traveled to Tobati, Paraguay and Jeremie, Haiti to treat underserved rural populations. He and his wife, Dr. Liza King, live locally with their four children. When not taking care of his patients and spending time with his family, Dr. King enjoys coaching, running, surfing, skiing and playing hockey. He is a native New Englander and an avid Bruins, Patriots and Red Sox fan.